The principle of inclusions states that inclusions found in other rocks (or formations) must be older than the rock that contain them. This is actually pure logic and it can be applied not only in geology, but it is especially useful for geologists. Contact between kersantite (rare fine-grained igneous rock that contains phenocrysts of phlogopite with other mafic minerals and also feldspars. It is a variety of lamprophyre1.) and granite. Width of view 16 cm. Note that there are one larger and several smaller pieces of granite within kersantite. Which one is older then, granite or kersantite? You probably know it already. It is really that simple. We can safely say that granite has to be older. It was already solid rock when it was intruded by mafic lamprophyric magma that scraped some pieces off of granitic rock and embedded them within the solidifying magma. Geologists call it relative dating — we know which one is older but do not know how old they are. Inclusions of foreign rocks that are found in igneous rocks are named xenoliths. 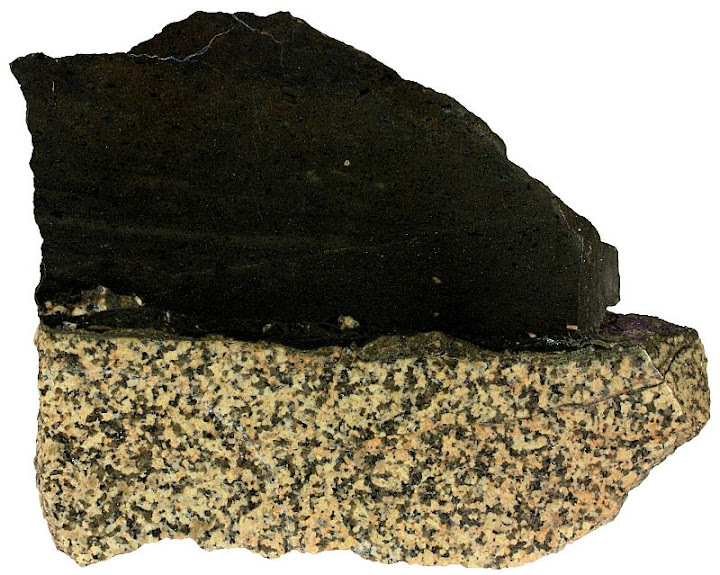 So we can also say that kersantite contains xenoliths of granite. The same principle is also used in relative dating of sedimentary rocks. It must be noted, however, that this premise holds water only if the inclusions are really made of matter that is foreign to the rock that contains them. True xenoliths are definitely older than their host rocks but sometimes igneous rocks contain cognate inclusions or restite material. S-type granites for example (granite with a sedimentary protolith) may contain such inclusions which are genetically related to its host rock. If this is the case, we can not say that the inclusion is older than the rock that surrounds it. Kersanite is a new rock name to me, but there used to be an outcrop of it near North Bay, Ontario- destroyed by road-building last time I visited. I just called it a lamprophyre, but from your description, pretty well convinced that was the rock. It had veins of barite, and was a beautiful cut. Nice. I haven’t seen it in the field.